Thursday's general election in the U.K. has left Theresa May, her Conservative Party, and the country in political chaos as they head into Brexit negotiations with the E.U. Meanwhile, leaders of the E.U. are showing no willingness to help the U.K. by slowing down the Brexit timeframe, and said they want to push full steam ahead with exit negotiations. Why it matters: The E.U. and its institutions have shown no mercy to the U.K. at a time when domestic political confusion means Brexit is an unwanted distraction. Talks are scheduled to start on June 19, but the U.K. government has yet to agree on a negotiating stance. 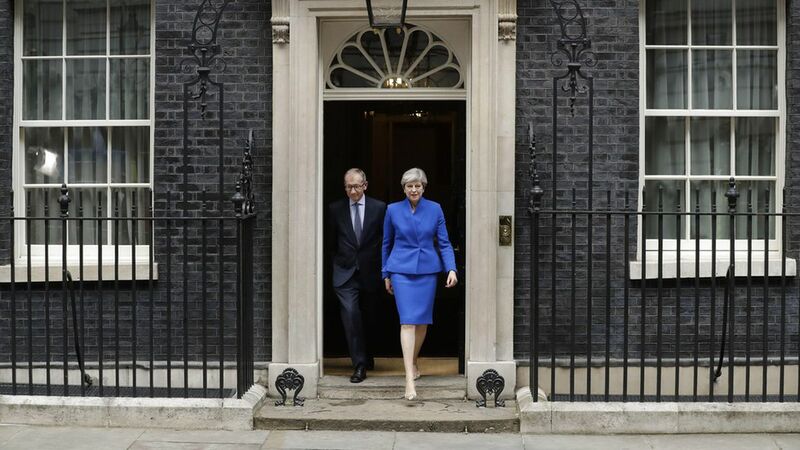 And now, following the election where they failed to gain a majority mandate, the Conservatives will have to rely on the Democratic Unionist Party in Northern Ireland moving forward, as their support is essential as the country heads toward Brexit talks. Donald Tusk, President of the E.U. : "We don't know when Brexit talks start. We know when they must end. Do your best to avoid a 'no deal' as result of 'no negotiations.'" Manfred Weber, Member of European Parliament (MEP) from Germany: "EU is united, UK is deeply split. PM May wanted stability but brought chaos to her country instead.The clock is ticking for #Brexit. Therefore the UK needs a government soon. The date for the beginning of negotiations is now unclear. We are concerned about the situation in Northern Ireland. The peace process should not be put at risk. Our position is clear: we want good relations with the UK but #Brexit means leaving the EU and the advantages that go with it." Guy Verhofstadt, MEP from Belgium and former Belgian PM: "Yet another own goal, after Cameron now May, will make already complex negotiations even more complicated." Martin Schulz, former E.U. President: Just talked to Jeremy Corbyn on the phone. We agreed to meet very soon... [translated from German] Whoever makes politics into a game, loses... this is now also May. Hopefully, UK-EU negotiations will not be even more difficult now." Michel Barnier, European Chief Negotiator for Brexitt from France: "#Brexit negotiations should start when UK is ready; timetable and EU positions are clear. Let's put our minds together on striking a deal."